These three new products along with 30 more professional lighting fixtures will make their debut at the LDI 2013 Show, held at the Las Vegas Convention Center, November 22-24 at booth #725. 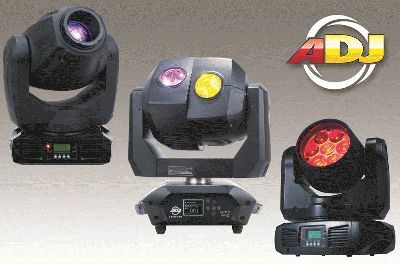 The three new Moving Heads that were revealed are the Inno Color Beam Z7, Inno Spot Pro and the patent pending 3 Sixty 2R. Inno Color Beam Z7 – Powered by seven 10W high output RGBW Quad Color (4-in-1) Osram LEDS, this lightning quick Moving Head comes equipped with a motorized zoom, variable 10-60˚ beam angle, 14 DMX channels, 5 dimmer curve modes, pan/tilt inversion, 16-bit fine pan/tilt, IEC in/out power connectors and more. The Inno Color Beam Z7 will help transform any club, stage or performance into a high impact light show. Inno Spot Pro – ADJ continues to push the boundries of LED technology with the Inno Spot Pro, a compact intelligent Moving Head with Motorized Focus, powered by an 80W LED source. Its hard edge beam is similar to a traditional discharge lighting fixture with a fraction of the power draw (only 140W), or the hassle of changing out light bulbs (LED rated at 50,000 hours). The Inno Spot Pro features 6 rotating, replaceable GOBOs, 8 colors plus white, and separate gobo/color wheels. 3 Sixty 2R – ADJ’s creativity and innovation collide with this patent pending, dual Moving Head that delivers continuous 360˚rotation. The 3 Sixty 2R is powered by the brand new Philips® Platinum 2R, 135W discharge lamp, rated at 6,000 hour lamp life. A lamp technology that ADJ co-engineered with Philips®. Creative sparks will fly with professional grade features such as: a 4-degree beam angle, 14 colors, 15 gobos, 8-facet prism and a frost filter (for wash effects). Each head’s colors, gobos and movement run independent from each other for a one-of-a-kind light show.